I've always loved planning and organizing events and birthdays but it wasn't until we had our first son, Micah, that I realized how much detail I was willing to pour into each celebration I planned for him. For each birthday, I always started with a theme. I've always loved doing more original themes rather than the more popular ones but I quickly learned that usually meant I'd have to end up making more of my own decor. Let me preface this by saying that I do not like crafts, I'm not a DIYer and I've never been into any kind of creative hobby (and I'm still not). Weird right? However, much like with everything else in motherhood, I learned something about myself when we had Micah. I was willing to go the distance to make birthdays magical for him, even if it meant I'd have to spend hours with a hot glue gun, trying to figure it all out! Every year, I made him a piñata from scratch and now that he's four, to him, if you haven't had a pinata, you haven't fully celebrated your birthday! I love that he remembers his second and third birthday parties and often recalls and comments on them. That just makes me want to continue making their birthdays special because I can see how much he loves and enjoys his parties. Planning Alessia's first birthday was so bittersweet. 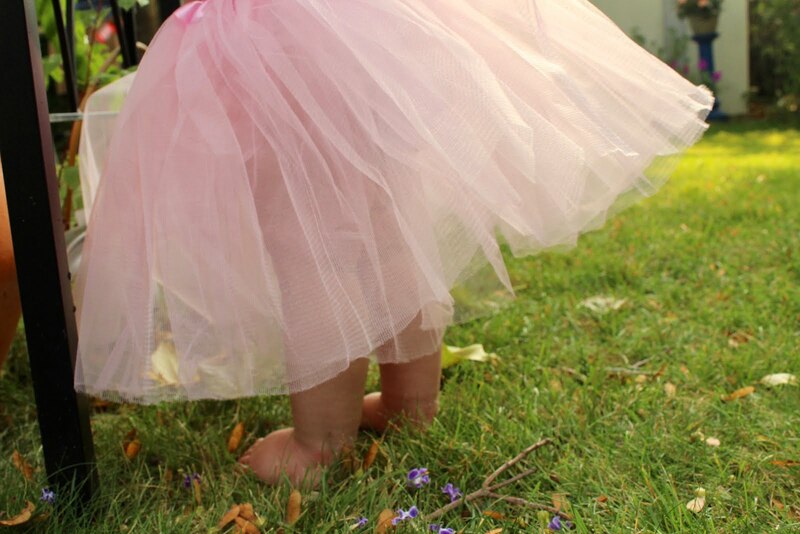 On one hand, your baby is turning one and you're left wondering where the infant went! It feels like we had just brought her home from the hospital on that cool, Fall evening. On the other hand, you have experienced the beautiful infant turn into a curious, outgoing little person full of charisma and personality! For Alessia’s first birthday, I had a theme in mind and began by looking at photos on Pinterest, IG and websites for design ideas I liked. For this birthday, I worked with some amazing vendors and I want to share some of them with you because their work is absolutely amazing. I have never been a fan of pink. That’s not to say that I’m against ALL pinks, just not that bright, bubble gum pink. I’m actually quite fond of pale pinks, millennial pink, blush and rose gold. 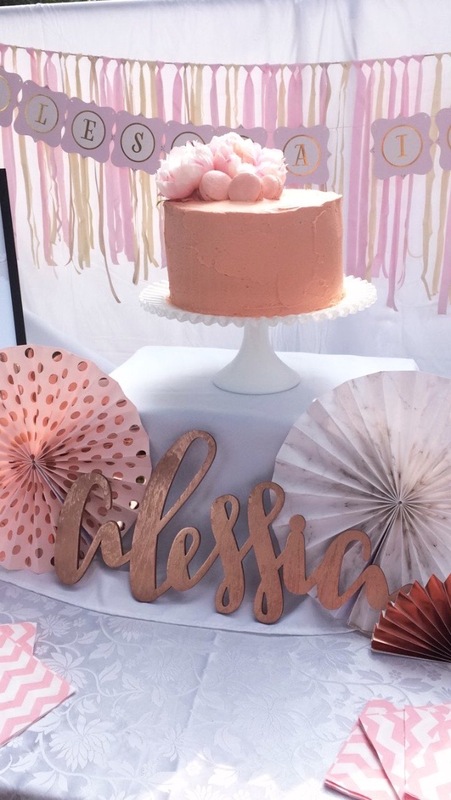 For Alessia’s first birthday party, I chose a variety of soft pinks, peach and used gold as an accent colour. I knew I wanted her name to be the focal point of the desserts table so I reached out to Andrea from Little Black Letter Company. I fell in love with her work from the moment I saw her it on her Etsy shop. I contacted her and explained what I had envisioned and watched as she took that and made a beautiful piece of art that she’ll be able to cherish for years to come. Andrea’s work is not only immaculate, but also oh so gorgeous! Andrea made a wood design carving of Alessia’s name in a calligraphy font and painted it rose gold. I’m so in love with this and I wasn't the only one!! At the party, I had tons of questions about where I had purchased it - her work definitely stood out among the rest of the decor. Just to let you guys know, I have saw her designs for the upcoming holiday season and seriously guys, it’s stunning. She has wrapping paper and hand painted ornaments. You can find Andrea’s amazing work here. 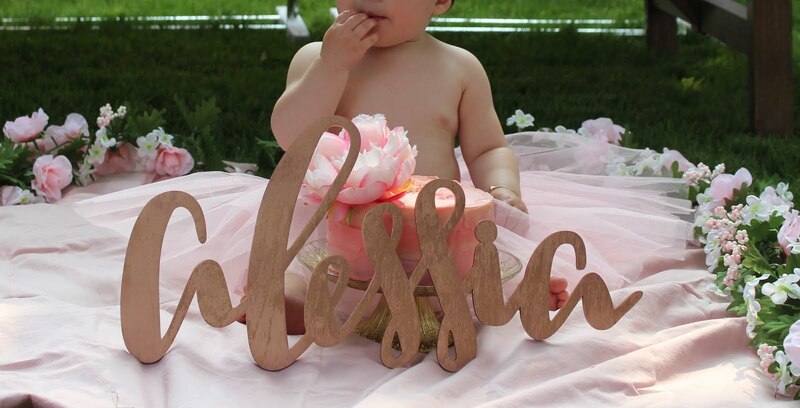 The sign we got for Alessia’s birthday will be going up in her room as part of her décor and to me and my mama’s heart, it will always be a sweet reminder of her very first birthday. Because we had a garden party, I wanted to make sure that the food we served was not only delicious, but fresh. I kept the menu simple because of the hot, July-like weather we were having in September. I’ve never received so many compliments on burgers before as we received during this party and that’s because we used TruLocal. They offer a meat subscription which sends your order directly to your front door. I love that their products are locally sourced, hormone free and antibiotic free. I didn’t have to worry about going out to the grocery store the day of in order to get the freshest, juiciest burgers. We also barbecued TruLocal's bacon for the burgers. Hands down, TruLocal is one of the best subscription box services I have ever come across! 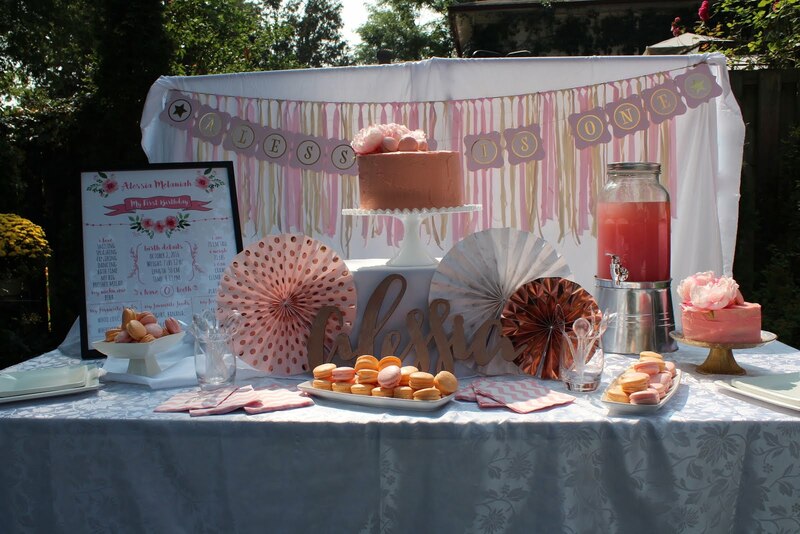 Of course I had to have a desserts table and what is a desserts table without macarons?! I have tasted many macarons before in the GTA but when it came to my little one's first birthday, I had to get the best and that is Macaronz. I selected macarons (Peaches & Cream and Strawberry) that would go well with the decor and Zanda from Macaronz, took care of the rest! What we ended up with were mouthwatering macarons that melted in your mouth. Needless to say, they disappeared...quickly. They sure were a crowd pleaser! Macaronz has recently expanded and are now offering High Tea Service. You can get all of the details here. For the past four years, each time my husband and I have a party to plan within our little family, we always get our invites from Tim Martinez. Not only is he talented and does graphics and designs for the Toronto Raptors and TSN, he also designs the best invites. Please check out his amazing website and portfolio because whatever type of design that you may need, whether it be for a logo, video, website, graphics or invites he's the guy. I promise you that he's the nicest guy that you'll ever deal with and delivers high quality work. You just have to hurry up and book him because he's in BIG demand! You can check out his work here or you can follow him on Instagram @letsgoraptors. And finally, what is a birthday, without cake? And much more importantly, what is a first birthday without a SMASH cake? When it came to dreaming up what I wanted for my little babe's birthday, I knew I wanted something rustic, minimal and beautiful. When talking to my sister Christelle about Alessia's birthday plans, she told me she'd love to make the cakes for her. Christelle, has always loved baking but I was amazed at how much love and dedication she poured into these cakes. Not only did they look gorgeous, they were delicious. Alessia was the sweetest with her smash cake and had no idea what she had to do with the cake that was put before her. When she finally understood she could put her finger in it, she never stopped licking her hand :) When Christelle isn't baking up a storm, she's travelling the world and taking beautiful pictures. You can check out Christelle's amazing travel blog here or follow her on Instagram (@lalalovelysquares). It's seriously swoon-worthy!! It was definitely a birthday to remember. It was full of love, laughter, family and friends and we couldn't have asked for a more perfect and memorable birthday for her. Thank you to all who made it so special! Thank you for sharing such an amazing post on events. It will help people planning to market their products / services or personal events.